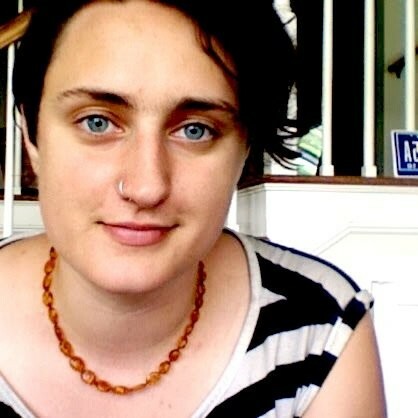 Faith Taylor (pictured below) writes about visiting Irina Putilova in detention in the UK. Irina sought asylum in this country because she is at risk of persecution as a political and LGBTQ (lesbian, gay, bisexual, transgender, queer) activist in Russia. Instead of finding refuge, she has been locked up in Yarl’s Wood Immigration Removal Centre. Yesterday, 7 December 2013, I went to Yarl’s Wood Immigration Removal Centre to visit my friend Irina (Ira), who is being detained there pending deportation. On Friday 6 December Ira had her first asylum interview. She was given no chance to present evidence and instead was served with papers stating that she had been placed on a ‘fast track’ process. She was told she could be deported at any moment, and she was put on a bus to the Removal Centre. In Russia, Ira has been systematically attacked, harassed, and threatened by the state and by far-right groups, because of her involvement in Voina, an internationally renowned art group, and because of her political identity. In 2012 she received direct death threats from the Centre E Russian police department. It is highly likely that the same unit broke her friend Filipp Kostenko’s legs two months prior to the threats directed at Ira, since he had also received very similar threats. Ira’s parents’ house was raided repeatedly. She was followed and subjected to repeated illegal arrests and police beatings. After living itinerantly with friends and acquaintances, fearing for her life, Ira fled Russia illegally. If she were to be returned there, she would definitely be arrested and imprisoned. My visit to Ira was surreal at best, terrifying at worst. After the multiple security checks, pat-downs, confiscation of all of our belongings (I came with a friend), we were finally released into the visitors’ room. Every door in Yarl’s Wood can only be opened via a guard directing a gatekeeper over walkie-talkie – a lengthy process, so in all it took around 40 minutes from our arrival to the point when we actually saw Ira. Despite being a generally cheerful and resilient person, Ira was visibly exhausted and looking very underfed. It soon came to light that she hadn’t been able to eat anything; she has not eaten animal products for several years and the only thing she had been given over two days was one piece of toast and an apple. We are now to believe, however, that she has been given something more substantial. In the visitors’ room, our meeting was patrolled by guards, who monitored our physical behaviour most of all. Ira at one point put her legs on my lap – she was swiftly instructed to remove them. This was despite several other (heterosexual) couples in the room being in much closer embraces. When Ira curled up in her chair with her feet on it, we were immediately approached by a guard who told her the visit would end if she did not remove them. All this to say that Yarl’s Wood is a prison: a high security, disciplinary prison, with the aim of placating its ‘residents’ just enough so that they leave the country quietly. If Irina returns to Russia she faces unimaginable persecution, including certain imprisonment upon arrival. She cannot be deported and the fast-tracking of her case is in serious contravention of the Home Office’s own policies on cases suitable for fast-track. There are so many complexities concerning Ira’s political identity, her LGBTQ status, the serious repression that she has faced hitherto at the hands of the Russian state. Ira is committed to working for her community. In Hackney she has set up an open-access free language school, she has created spaces, workshops, events, and concerts for the discussion and affirmation of LGBTQ issues. No one seeking asylum should be treated like a criminal. Irina should be released immediately, taken off fast-track, and given the chance to present the wealth of compelling evidence she has regarding her case. To not grant her even this simple right is an aberration for a country claiming to value and protect LGBTQ persons and freedom of speech. Faith is a musician and activist based in Hackney. Faith’s twitter: @thefaitht. Campaign twitter: @irinamuststay. Please join the Facebook campaign group and sign the petition. We are delighted to say that Irina was released from detention on 9 December! Thank you all for your solidarity in standing up for Irina. This entry was posted on 08/12/2013 at 11:18 AM and is filed under Uncategorized. You can subscribe via RSS 2.0 feed to this post's comments. You can comment below, or link to this permanent URL from your own site.